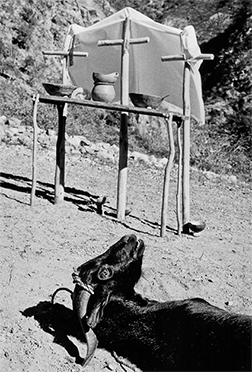 At this ranchería, preparation for the ritual begins several days in advance with the communal act of grinding corn and cooking by the women, a public picture of their life at home. Men gather firewood, prepare the dance floor, sacrifice animals at the altar and make Mate Chine crowns, scepters, rattles and robes for the dance. The ritual commences with music and dance at night-fall on December 11th and continues with feasting and intermittent dancing throughout the day of the12th. From 2002 – 2009 I photographed this celebration, adding video to present the sounds, movement, and color that this beautiful pageant offers. Today, as rapid change and social upheaval sweep through the Sierras, even the remotest rancheria is affected by the impact of environmental and political policy. As these aboriginal people rub against Western civilization’s values and power, their ritualized beliefs, no longer serving a purpose, are discarded. Elders seek to pass the mantle of leadership to youth who, seduced by the promise of opportunity outside their culture, leave the land. The Mate Chine dance pictured in this series may survive in some form, but the beliefs and ceremonial aspects, the original intention, will be lost. This is why I believe these images are important, the last of their kind.